The Dark Knight is almost upon us, and frenzied fanboys haven’t found themselves so lathered up since having to wash off the stink of Tobey Maguire’s dance moves in Spider-Man 3. See my words and mark them: Someone or someones you know will soon use superlatives like “brilliant,” “amazing,” or “fuggin’ fuggtastic” in the course of telling you that (a) The Dark Knight is perhaps the best superhero movie ever, and (b) Heath Ledger deserves an Oscar. Don’t say I didn’t warn you. You might just find yourself jaded by the cacophony of broken-record hype. Which is too bad, because the movie really is, well… fuggin’ fuggtastic. And deserves all the credit it gets. That’s why I’m putting out a call for genuinely novel and creative ways for fanboys (and -gals) to express their enthusiasm for the newest Batman film from director Chris Nolan. You could do worse–well, depending on how you look at it–than to take a cue from the dude who emblazoned a tattoo of the Batman symbol from Batman Begins and The Dark Knight across his back, courtesy of Tony Siemer of New Breed Tattoo in Dayton, Ohio. My customer is a total Batman freak! He had an old nasty dark tattoo that he wanted covered up so we used the symbol and I added the beveled edge which seems to really work! Hell yeah, it works. It looks like someone cut the Batman symbol from a plate of steel and slapped it onto his back hard enough to leave a welt. Seriously, though. You can see the red marks. I didn’t use the words “brilliant,” “amazing,” or “fuggin’ fuggtastic,” though. I said there weren’t enough superlatives to describe TDK. I think that’s just a nasty case of backne. I call fake. POV not consistent with angle of back, and wingtips fail to curve around sides of shoulders. Yeah, if you click on the picture and look at the artist’s other tattoos you can see that a tattoo that large should curve around his shoulders. Think that pic is a fake! BTW, real nice blog. I’m linking it in mine ;). This is the internet so everything is a fake. I’m a huge huge batman fan, who’s a female. This is absolutely awesome!! I’ve got to admit I’m pretty jealous. I def. have plans for a Batman tattoo in the future, though it won’t be quite so big. Not sure whether to do the traditional batman logo to the new one. But I am blown away by this one! 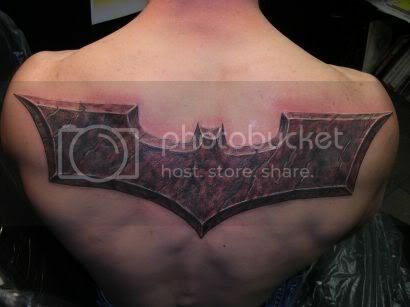 Dude… The guy with the tat on his back of the bat signal? ? ? This is a fake if I ever so one. It is so much so, that I can tell that this guy doesn’t know photoshop well enough to make it a reliable fake. It is simply a lazy fake. Next post: Geek Steal: Refurbished Xbox 360 for Only $199 and Free Shipping!